Prehypertension is defined as borderline blood pressure levels that do not fall in the range defined as hypertension. Since the definition of hypertension has changed over the years, the definition of prehypertension has changed too. The term “prehypertension” was used in 2003, by the Joint National Committee on Hypertension. However, already in the 1920s and 1930s, insurance companies used the term prehypertension for slightly elevated blood pressure levels which were well within the normal range but were clearly associated with increased morbidity and mortality. These data, accumulated by insurance companies, were used for risk calculation in order to price insurance policies. 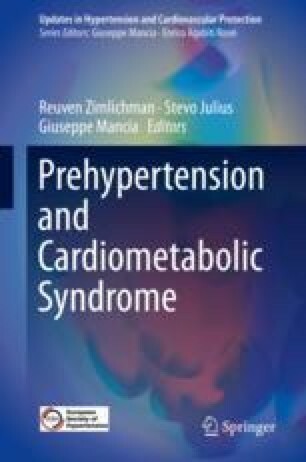 Over time, several studies demonstrated that the prehypertensive range carries an increased morbidity risk. The earliest and most impressive was the study of 22,741 US army officers (Levy et al. JAMA 129(9):585–588, 1945) published in 1945. It showed that persons with transient hypertension (some readings high and some normal) had higher rates of disability retirements with cardiovascular and renal diseases. A recent large meta-analysis confirmed the association of prehypertension with higher cardiovascular risk (Huang et al. BMC Med 11:177, 2013). Whelton PK, Carey RM, Aronov WS, et al. ACC/AHA/AAPA/ABC/ACPM/AGS/APHA/ASH/ ASPC/NMA/PCNA Guidelines for the Prevention, Detection, Evaluation and Management of High blood Pressure in Adults: A Report of the American College of Cardiology/American Heart Association Task Force on Clinical Practice Guidelines. Hypertension, Published online November 13, 2017. http://hyper.Ahajonrnals.Org/early/2017/11/10hgp.0000000000000066.